It was just a regular Monday evening. We drove big brother Kevin to soccer practice at the high school and parked our car. I pulled out the baby jogger, and Joel climbed in with his snacks and blankets. 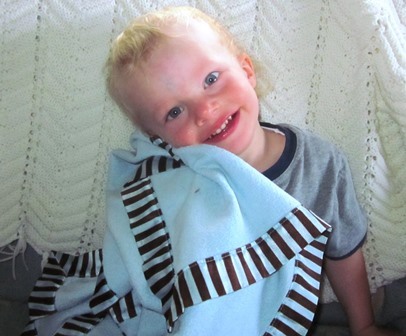 One blanket is his very special blue blankie with silky edge that goes with him everywhere. I like to get my exercise walking around town, and Joel always wants to end at the park. There Joel climbs every ladder and slips down every slide. On this day when the time came to pick up big brother, we headed back to the high school. Upon reaching the car, we realized that favorite blue blankie was gone! Immediately we began our search. Daddy, who had joined us at the park, led the way in re-tracing our steps. I prayed, “Dear Jesus, please help us find Joel’s blanket.” When we arrived at the park, there was no blanket. We re-traced our steps again back to the high school, still no blanket. Oh, what a sad drive home! In the following days we prayed, made posts on Facebook, returned to the park, put up flyers, placed an ad in the paper, checked the Sheriff’s office, called the schools and hospital to check lost and founds, stopped by the thrift stores, told all our friends, and kept praying. I reminded God that all the LOST parables have a happy ending. Could we please have a happy ending, too? Joel was a real trooper all this time, using a substitute blanket while looking at me with sad eyes. Then, three days after it was lost, a little girl called Daddy’s cell phone to say she found it! She had seen the flyer at the park. Daddy https://www.wnymedical.com/buy-accutane-acne/ picked blankie up on his way home from work. Joel met Daddy and big brother Jacob at the front door. He took his blanket and danced around the living room for several minutes, spinning and waving blue blankie in his own special dance of praise. Then at supper he held the silky edge and tag in his left hand, while eating with his right hand. He must have plans to never let it go again. 1) God hears and answers our prayers! What an encouragement for me with all the other prayer requests I had that same week. 2) We have to do our part after we pray. Remember how the woman swept her house to find the coin? The shepherd left the 99 to find the lost sheep. The Father kept a constant lookout for his lost son. Imagine what they would have done if they had Facebook! 3) It’s great to rejoice with friends when the lost is found! 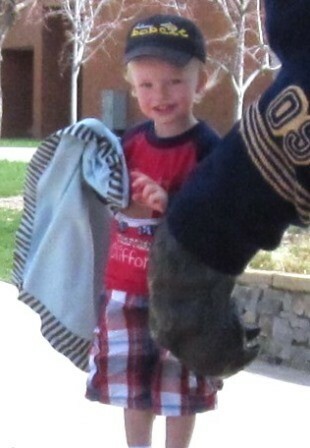 So many people rejoiced with us when Joel’s blanket was found. Thank you, dear friends. I hope it encourages you, that God does hear our prayers. Today’s TEA CUPP: Why not pour yourself a cup of tea and sit down to read Luke 15 today? Get lost in the LOST parables and let God show you how much He loves you! This entry was posted in My Tea Cupp for Moms, Understanding and tagged christian prayer, devotions for moms, devotions for mothers, encouragement for women, God's Word in Prayer, My Tea Cupp Prayers, Tea Cup Prayers, Understand by Jennifer Grace. Bookmark the permalink.